Vitamin C, or Ascorbic Acid, is one of the most important micronutrients for the body. It is an especially useful compound when it comes to boosting the body’s immunity against diseases. For men who are 19-years old and older, the recommended amount for vitamin C intake is 90 mg every day. For women 19-years old and older, the recommended amount of vitamin C intake is 75 mg every day. Vitamin C helps protect the body’s cells from being damaged by free radicals and their harmful effects. This is why vitamin C is called an antioxidant. Basically, an antioxidant (vitamin C in this case) acts as a scavenger for free radicals and in doing so, repairs the damage that is inflicted by these free radicals. Examples of significant damage done by free radicals in the body include macular degeneration, cancer, heart diseases and diabetes. This vitamin also helps in collagen formation. Collagen is needed in order for gums and blood vessels to be healthy. It is also an important ingredient in the development of teeth and bones, as well as in the healing of wounds. Ascorbic acid also helps in resisting infections, and in preventing the common cold. It can also be used as treatment for colds. Studies have suggested that ascorbic acid can decrease the possibility of developing certain cancers, cataracts and heart diseases. 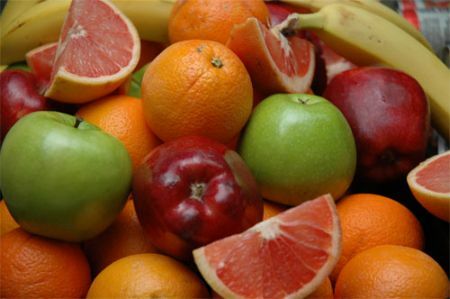 Vitamin C is commonly found in vegetables and fruits. Specific food sources for this vitamin include kiwi, broccoli, tomatoes, potatoes, carrots, bell pepper (red), oranges, strawberries, watermelon and bananas. Grapefruit is also a very good source of vitamin C. In fact, a half of a grapefruit provides the body with over 75% of its vitamin C requirement every day. Because vitamin C is one of the most popular and most common vitamin supplements, there are cases where people take too much of it, leading to an over dosage of ascorbic acid. The daily requirement for vitamin C is only between 75 to 90 mg (in adults), a 1000 mg vitamin C intake is already too much. The body does not absorb this excess and instead it will be discharged through urine. Consuming too much vitamin C, especially if you have been experiencing an existing health condition (like muscle sprains or inflammatory diseases), can lead to uncommon health problems. Especially for people taking iron supplements, an overdose of vitamin C can result in an accumulation of rust deposits in the body. This will result from the combination of Iron and vitamin C inside the body. Although this situation is still under study, a number of cases like this have led to death.